Twelve-year-old Emily Alford’s newfound love of the age old game came quite by chance, when she and her mom drove past a lawn bowling match in progress about a month ago. Two good friends were already skimming balls down the green when the Beaver Bank girl dropped in to play. Her first game was a bit shaky and her aim slightly off, but Alford was hooked. Just one month later, Alford and other young players from all over Canada brought their best game to the Lawn Bowling Canadian Junior and Under-25 Championship in Dartmouth Wednesday. While she has not yet told her schoolmates, Alford says lawn bowling was a good way to make new friends elsewhere. “I’ve met so many people just from this week,” said Alford. One new companion is Jordan Kos from Regina. Unlike Alford, 17-year-old Kos is a nine-year lawn bowling veteran. Her journey started when she spotted an ad in her school newspaper. When she replied, it was her coach’s husband who invited both Kos and her cousins to their first game. “After the first bowl we were hooked,” Kos recalled. 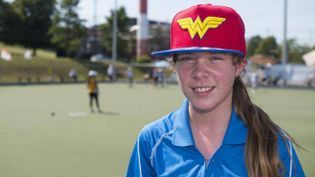 Since then, she has competed all over Canada and the world, playing matches as far afield as Australia and Hong Kong and has qualified for the Canadian national team. For Kos, the best part of playing lawn bowling is travelling to new places, giving the lie to claims that it is a sport played only by seniors. She said that the game has taught her about endurance, saying that teams often played several games that involved lots of walking and bowling under a hot sun. This means signing up new players who can meet new people and travel as they master the game. “The youth are seeing it as a real challenge, that there’s a lot of skill involved,” said Kos. Nova Scotian lawn bowlers could be seen in blue tops, joining competitors from other provinces at the Dartmouth Lawn Bowls Club. The Jr. Youth Program for 2016 Season plus a few friends! Tony Lynch won 2nd Place!